"Outstanding Achievements, Commitment and Dedication in Water & Draught Work"
Winnie was born with underdeveloped eyes and no retina in one and a cataract in the other. In her first year Winnie would quite often swim and we devised a certain clapping sequence so that she knew where I was and that it was me, or those who were working with me who were 'calling' her. She did pass her Level A, but as her sight failed, so did her confidence in the water and by the beginning of her second year with no remaining vision she stopped. Nowadays she paddles at the waters edge whilst one of the other dogs is working and occasionally launches herself after them, which can catch the land handler off guard, as they then need to swim out with her to make sure she is safe. All of FSWN, our working group, know this and are very good at responding when it happens. If she doesn’t want to swim, we play find the floating treats at the waters edge for her. This she thoroughly enjoys and everyone is happy to do this for her whilst we swim the other dog. Carting is a different story altogether. She seems to really enjoy it and although we have had a few occasions where she was not comfortable in places where she had not been before, I grew to learn that it could also be anything from a certain scent to noises such as electric fences and had to learn to adjust her training and working accordingly. It also meant getting to a venue the day before to introduce her to her surroundings before everyone else arrived. This worked very well and she has now passed Level 3 having already attained her Level 2 multipass both on her own and in a brace with Tally. She suffered very badly in 2007 when she caught a virus and her immune system couldn't cope. She then got Vitiligo, where she lost the fur around her eyes & muzzle & the skin turned pink. She looked so sorry for herself and the vet was extremely good in recognising that this meant antibiotics were not the way to get her better. He is a firm believer in alternative medicines working along side traditional medicine and so was happy for me to contact a homeopath who would help us. The homeopathic remedy was fantastic (thank you so much Chris), and she picked up within a couple of months, although it has taken two years for her pigment to go back to normal and her fur at the front and back of her body is now all silver grey (and very distinguished I might add!). When I am out walking with my dogs, she is nearly always the one in front. The others have the discs placed on their collars together, so that she can hear where they are and although I no longer use legbells when we are out walking, she nearly always seems to know where I am. If she loses us, she just stands still and listens. Most people who meet us have no idea she cannot see and I have, on occasion, forgotten myself, which sounds awful but those who know her will understand. We have regular walks where I don’t have to worry about her bumping in to things and she knows these walks inside out and back to front. I taught her from the start to walk on the path and when she treads on the grass, she corrects her direction and carries on forwards. When I play fetch with Casper, my Newfie/Boxer cross, she chases after him until she loses him, then she stops and waits tipping her head from side to side trying to hear where he went. He fetches his toy then runs back to me, checking where she is and if she is not in line with us, he veers off to her and brings her back with him. It really is an amazing relationship they have built up and to watch him do this is truly fascinating and proves to me that other dogs know she cannot see things. 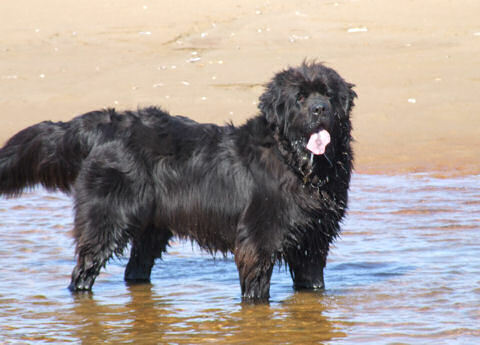 She is a very special dog and has copious amounts of courage and curiosity and I am so very happy that she was given the chance to live and enjoy a normal Newfoundland life. I am also very proud that I was chosen to have the honour of adopting her. She truly is one in a million.